The agricultural-products powerhouse is also prone to being knocked around by volatile oil prices, but a major debt offering eroded investor confidence, as well. Image source: United Soybean Board/Flickr. What: Shares of global agribusiness and food company Bunge (NYSE:BG) fell 12.4% last month after closely tracking oil prices, and issuing nearly $670 million in new debt. So what: Agricultural commodities are easily influenced by oil prices, which Bunge investors have been keenly aware of since crude oil began its steep decline in late 2014. 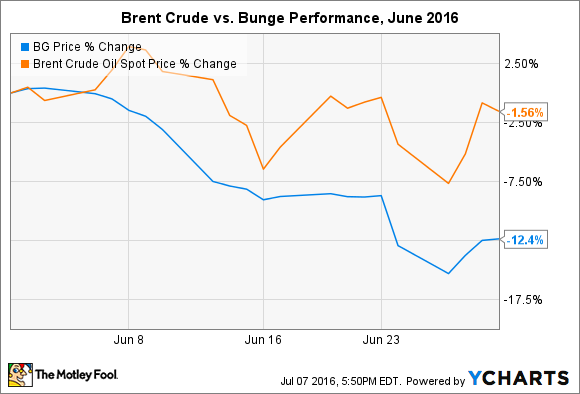 As shown in the chart above, crude oil slipped 7.5% in just a four-day period at the end of June before sharply recovering. Bunge shares closely mirrored the move, although did not recover all the lost ground. In addition to any influences from crude oil prices, Bunge shares took a hit after announcing and closing a debt offering of about $670 million. Using numbers from the end of the first quarter, net proceeds of roughly $660 million will boost the company's cash position by 45%, and long term debt by 17%. The strongly profitable company wrestled an interest rate of 1.85%, which is relatively low. The last debt offering by the company, in November 2015, was accompanied by an interest rate of 3.5%, so investors should be happy the company is taking advantage of favorable market conditions. After the offering, and adjusting for operational expenses in the second quarter, Bunge should have the most cash on hand since the end of 2014 -- or over $2 billion. That's still far from the $5.7 billion watermark set at the end of 2013, but represents nearly double the cash on hand just three quarters ago. Now what: What Bunge will do with its growing war chest is anyone's guess, although there are quite a few smaller companies struggling to stay afloat with current commodity prices. Will that pose an opportunity for Bunge to acquire long-term growth? Investors can't be sure that acquisitions are in store, but building your cash position -- while simultaneously divesting non-core assets -- is never a bad thing.